Here is week 56 of the 100 WC for Grown ups. It is a weekly challenge for all those writers who want to extend their audience to get feedback on their work. The prompt this week is … being clear is essential to … It has to be based on this prompt and be only 100 words. I sat in that dark damp room, wondering how on I was going to get out. I didn’t have any ingredients with me other than salt, I was weak, but I hoped my powers were strong enough. I concentrated, being clear is essential to a spell. You don’t want to turn yourself into a toad, if you meant to turn your ex-boyfriend. My plan to become as clear as the air, it would only work for a few minutes, but I hoped it would be enough for me to get out of the locked room unnoticed when my captor arrived. 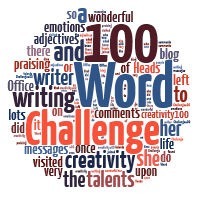 Check out the other entries for the 100 WC and if you get a chance why not check out the children’s version of the 100 Word Count Challenge, there are some fantastic pieces on there.